North Walsham Norwich Road red brick tower mill stood just to the southwest of the town and the two railway stations. The 6 storey mill had patent sails and a fantail that powered 2 pairs of French burr stones 2 flour mills and a jumper. A Capital Brick TOWER WINDMILL driving two pair of Stones, two flour mills and a jumper, with patent sails and every other requisite complete. Also a good Granary, and Dwelling House with about five and a half acres of superior land. The above Estate is situate at North Walsham, Norfolk and is now in the occupation of Mr. Dyball. Apply to Mr. Durrant, Solr. Surrey Street, Norwich. A Superior BRICK TOWER WINDMILL in North Walsham near the Norwich Road which winds herself and contains six floors, 2 pair of stones, 2 flour mills and jumper, with patent sails. Also Dwelling House and three acres of arable land. Apply to Wilkinson & Baker, Solrs. North Walsham. A Powerful TOWER WINDMILL in Full Trade driving two pairs of stones and recently put in thorough repair, with a Dwelling house, Barn, Outbuildings and 3 Acres of Land adjoining, situate at North Walsham, now in the occupation of Mr. Durrell. Apply to Mr. Baker, North Walsham. A substantial BRICK TOWER WINDMILL in full trade,recently put in thorough repair, with a Dwelling House, Barn, and other Outbuildings and 3 acres Land adjoining, situate at North Walsham, now in the occupation of Mr. Joseph Durrell. The principal part of the purchase money may remain on mortgage at 4%. Apply to Messrs. Wilkinson & Baker, Solrs. North Walsham. To be sold or let. With possession Michaelmas next. 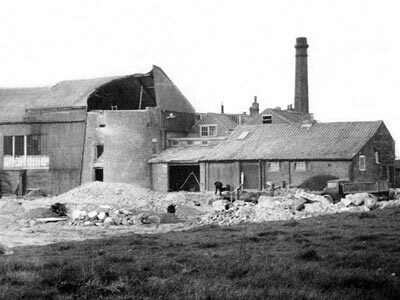 A powerful TOWER WINDMILL in full trade driving two pairs of stones with a Dwelling House, Barn, Outbuildings and 3 acres of land adjoining situate at North Walsham now in the occupation of Mr. Durrell. A SUPERIOR BRICK TOWER WINDMILL in North Walsham near the Norwich Road which winds herself and contains 6 floors, 2 pairs of stones, 2 flour mills and jumper, with patent sails. Also a Dwelling House with Barn, Stable and other requisite outbuildings and 3 Acres of Land adjoining. A Superior BRICK TOWER WINDMILL at North Walsham which winds herself and contains six floors, two pair of stones, two flour mills and jumper, and patent sails. Also Dwelling house, Barn, Stables and outbuildings and 3a. 1r. 20p. of Land late in the occupation of Mr. Durrell. By directions of the Trustees for Sale under the Will of the late R. Baker, Esq. A SUPERIOR BRICK TOWER WINDMILL in North Walsham near the Norwich road which winds herself and contains 6 floors, 2 pair of stones, 2 flour mills, jumper and patent sails, together with a comfortable Dwelling House, barn, stable, outbuildings and 3a. 0r. 0p. of Arable Land adjoining, late in the occupation of Mr. Joseph Durrell. 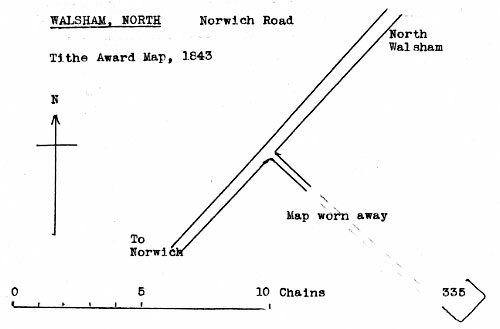 Copyhold of the Manor of North Walsham, Fine certain. Apply to Wilkinson & Baker, Solrs. or the Auctioneer, North Walsham. A Powerful TOWER WINDMILL driving two pairs of stones recently put into thorough repair, with a Dwelling House, Barn and Outbuildings and 3 acres Land adjoining situate at North Walsham. A Powerful TOWER WINDMILL driving two pairs of Stones, recently put into thorough repair, with a Dwelling House, Barn, Outbuildings and 3 acres of Land adjoining situate at North Walsham, now in the occupation of Mr. William Burton. To be SOLD or LET, with immediate possession, a powerfull Tower WINDMILL driving two pairs of Stones, recently put into thorough repair, with a Dwelling house, Barn, Outbuildings and Three Acres of Land, situate at North Walsham, now in the occupation of Mr. William Burton. To be SOLD or LET, with immediate possession, a Powerful TOWER WINDMILL driving two pairs of Stones with a Dwelling house, Barn, Outbuildings and 3a. 1r. 20p. 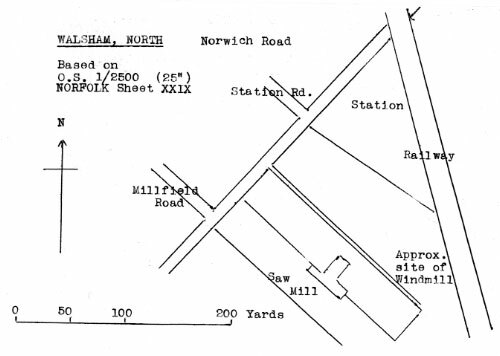 of Land, situate at North Walsham. To be Sold by Tender, the entire MACHINERY & FITTINGS etc. of a large Tower Windmill. For particulars and cards to view apply to R. Cornish, Builder, North Walsham, to whom tenders are to be delivered on or before 14 July 1874. The highest or any other Tender not necessarily accepted.